In his book, Ekstein pushes us to think about the dangers of feeling too comfortable in life, and talks about the relationship between wealth and physical and emotional happiness – which can create conflict. But there is a way out. “If you ever want to leave your prison, step number one is to identify it,” said Ekstein. The book helps readers take a deep-dive into their inner happiness — first, to discover their own prisons and then goes on to map-out a course of necessary steps that will result in positive life-changes. Bob Proctor, a New York Times bestselling author and Co-Founder of the Proctor Gallagher Institute, has been a longtime teacher and friend of Ekstein. “Chaim’s message that the biggest obstacle preventing us from creating the life of our dreams is the prison of comfort we have created for ourselves left me thunderstruck,” said Bob Proctor, best known for his work with The Secret. Ekstein has worked as a financial planner since 2005 and despite his clients’ financial success, he’s observed that for many of them, money can’t buy happiness. It’s from this experience that Ekstein first conceptualized the comfort prison and learned how to help people escape it. 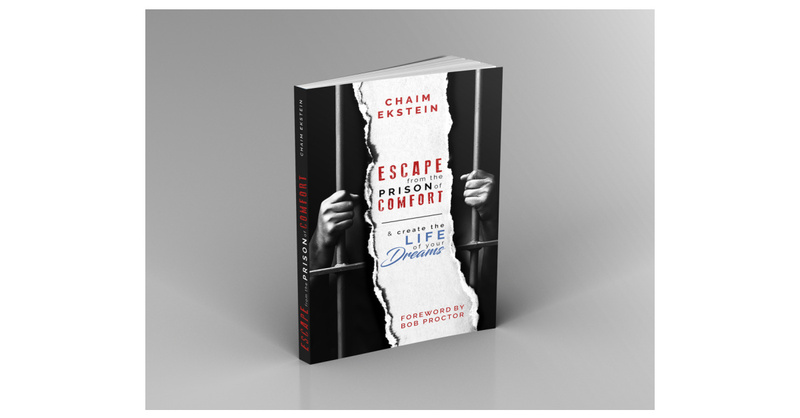 “Escape from the Prison of Comfort and Create the Life of your Dreams” is now available on Amazon Books here. Visit Chaim Ekstein to get exclusive advice here: website, Facebook, Twitter, Instagram, and Youtube. Chaim Ekstein was born in Manhattan into a traditional Jewish New York community. He has owned an insurance practice since 1999, receiving his Certified Financial Planner™ certificate in 2005. Ekstein identified his own unique talent as motivating and empowering others to live by the Total Wealth Formula, which inspired him to write his first book and become a speaker on the topic. He currently works as a speaker and financial planner and lives in New York with his wife and 10 children.